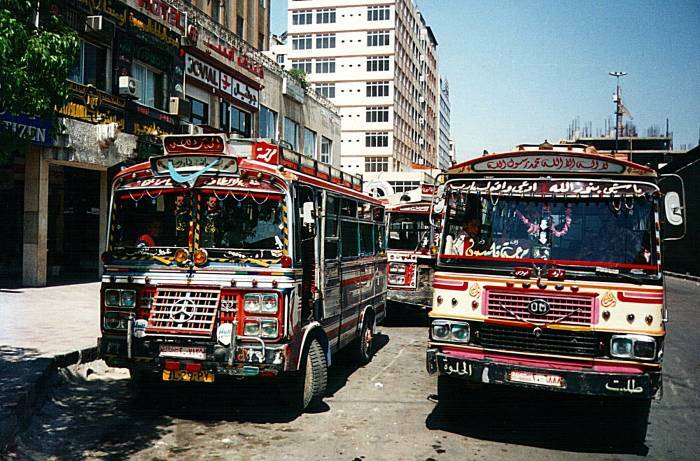 Various forms of buses provide the main means of transportation in Syria. For longer inter-city trips, at the top end are the private companies' long-haul luxury buses. 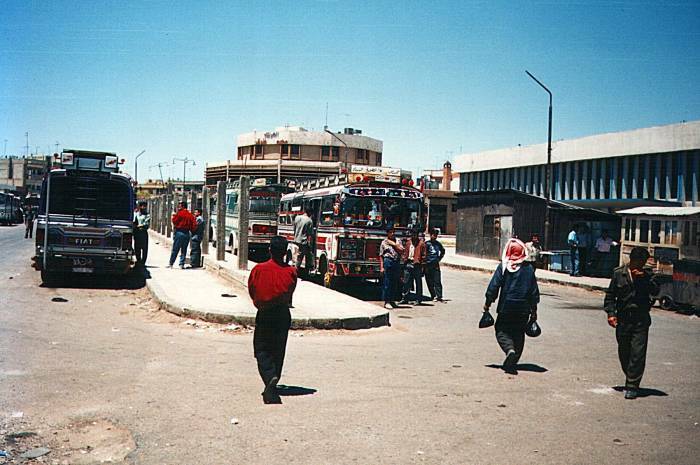 There are also the state-run Karnak bus line and some other non-luxurious but still serviceable large buses. Shorter trips, or even two-hour inter-city trips such as between Himş and Tadmur, may be on minibuses or Pullmans. 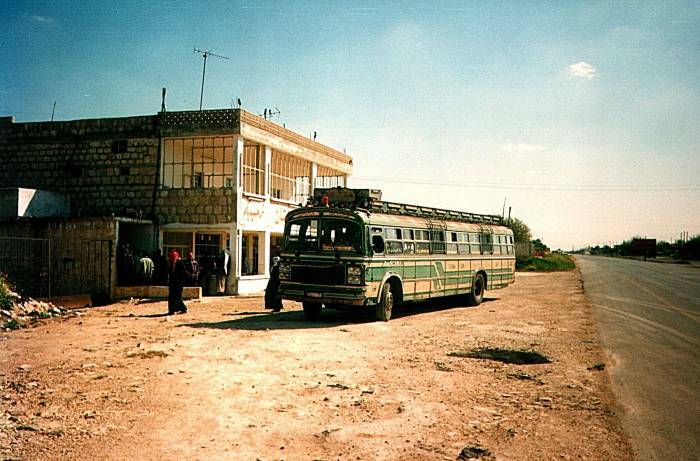 Short trips may be on unscheduled minibuses operated like Turkish dolmuşlar. Here are colorful minibuses. They're called Pullman in Syria, and operate like the dolmuş in Turkey. We're down at the Hamah bus station, looking for the right bus. They're wildly colored vehicles seating maybe twenty passengers. You pay based on how far you're going. The specifics of the decoration vary according to the tastes of the drivers, but all Pullman drivers' tastes tend toward the gaudy. All have multi-color paint schemes, and the "Allah Watch Over Me" slogan they see as carte blanche to tempt fate and test Allah with their recklessness. There are also at least two or three pictures of the current member of the Assad family, absolute rulers since 1971. From that basic starting point, some Pullmans are filled inside with multi-colored ribbons. Others have motifs of plastic fruit, or woven beadwork. The decorations are strung all around the driver and obscure significant portions of the windshield. 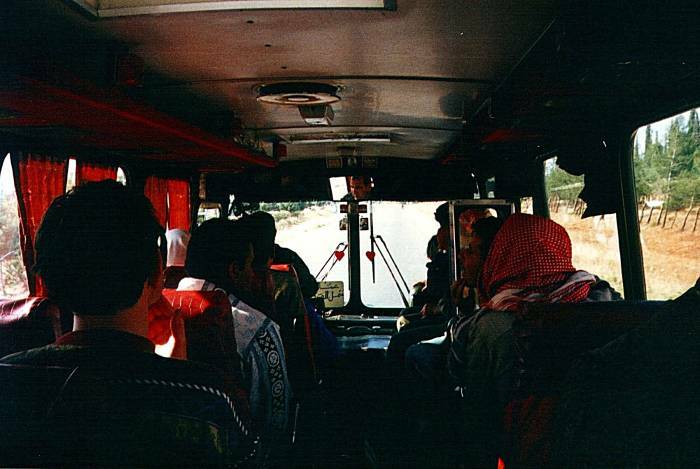 The Syrians have the same philosophy as the Turks regarding minibus ventilation — it must be prevented! Expect stifling heat. Here's the view forward from the back seat of a Pullman. This is a rather subdued example! Here we see a long-haul bus taking a tea-and-toilet break. Some of the long-haul buses have video systems on which they play movies of scratchy audio and dubious plot. Karnak is a national bus company operating long-haul orange buses that are meant to be a little more luxurious. Softer seats, and while there isn't much ventilation at least there are curtains you can pull over the windows to make the bus a little less of an oven. The nicest buses are the Mercedes units operated by some private lines. There isn't a lot of rail transport in Syria. There is supposed to be a train running between İstanbul and Damascus once or twice a week via Ankara, but it's even less publicized than domestic Turkish rail service. I have seen that there is now frequent rail service between Aleppo and Damascus, with some of the runs possibly stopping in Hamah and Homs. On my first visit to Syria, I took Syrian Arab Airlines back to Istanbul. A fine Tupolev Tu-154 with all metal bulkhead panels inside. Kind of like being in the Soviet Air Force back in the day. 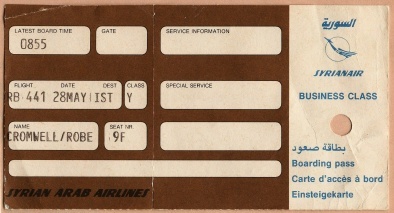 SyrianAir boarding pass. Don't get too excited by the "Business Class", all the boarding passes said that. Fairly cheap flights can be purchased from agencies around Martyr's Square in Damascus, if your travel plans are somewhat flexible. The details of getting a Syrian visa change, possibly with the whims of the local consul. Depending on which country you're from, and where you're trying to get the Syrian visa, and possibly the mood of the consul, you may need a letter of recommendation from your consulate. And if you're from the U.S., and your country's consulate is a heavily fortified compound that really doesn't want to deal with anyone, let alone nutty Americans who want to visit a country where cruise ships don't dock, you might be out of luck. I was fortunate — at least when I first went to Syria, Americans trying to get a visa from the Syrian consulate in İstanbul only had to fill out a form, pay about US$ 30, leave your passport, and return in a couple of days. The second time, I got the visa in Cairo and it arbitrarily took seven days. 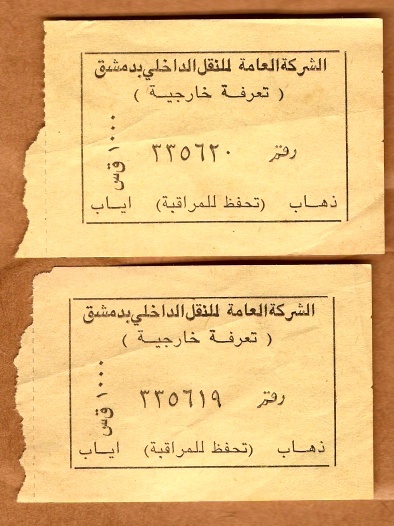 Fine — I was heading up the Nile to Luxor and Aswan, so I would pick up the visa on the way back before going to Sinai. 5 S£ and 10 S£ bank notes. 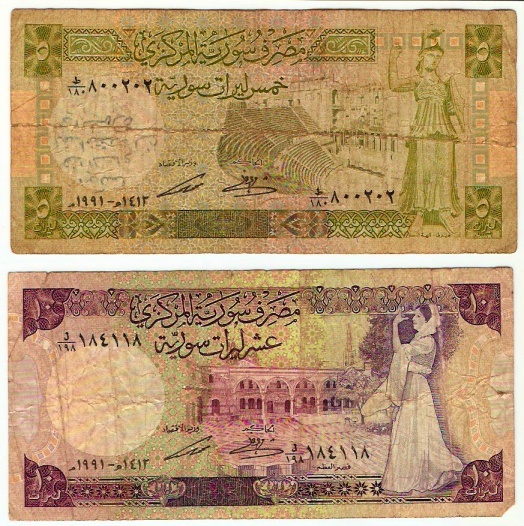 You should have no problem changing money in Syria. It's hard to find a place where no one is looking to exchange some Syrian Lira for US Dollars or British Pounds or Euros. It's officially illegal but everyone does it all the time. The black market may offer something like 125% the bank rate. That is, an amount of foreign currency that would get you 100 S£ in a bank might get you 125 S£ in a discreet exchange at your hotel. Of course the main language is Arabic, but you see and hear a lot of French. Today's Syria grew out of a colonial contraption called the French Mandate from the fall of the Ottoman Empire at the end of World War I through the end of World War II. Much of the infrastructure has its origins in early 20th Century French systems. Of course the French presence in the country goes back to the Crusades. I found that many older people knew some French from studying it in school. You also see and hear and quite a bit of Russian, especially in Aleppo and from younger men. Aleppo has the highest concentration of immigrants from the former Soviet Union. While they're a mix of Armenians, Georgians, Azeris, Uzbeks, and so on, they were all compelled to learn Russian in school. See the pictures of Aleppo for some examples of Russian signs. Syria was a client state of the Soviet Union, and still has some military ties with Russia, at least as a customer. The Syrian Army's armored vehicles are Russian, and so are the Air Force's aircraft. I took French in high school and Russian in college, and so I found it very easy to get around and communicate with people who weren't working in tourism. In Jordan and Egypt I was less successful when communicating with random locals. Of course you need to know how to be polite in Arabic! See the table above. These are really Hindu or Devangari numerals, as adopted and used by the Persians and Arabic speaking people. This was when Europe, to the extent it used numbers at all, used Roman numerals. Hindu mathematicians had developed positional numeral systems — the concept of the ones digit, the tens digit, the hundreds digit, and so on. They had also developed the concept of a numeral to indicate zero. Roman numerals had none of that, making them useless for calculation and cumbersome for simple record keeping. It's hard to see how the Romans accomplished nearly as much as they did, stuck with such a useless numerical system. About 825 AD the Persian mathematician Abu Jafar Muhammad ibn Musa al-Khwarizmi (Muhammad, the father of Jafar, son of Musa, the Khwarizmian) wrote a work titled On Calculation with Hindu Numerals. This is the same al-Khwarizmi whose name is the basis for the word algorithm. In 1145 the Englishman Robert of Ketton translated al-Khwarizmi's treatise on algebra (yet another Arabic word) into Latin, opening it with "Dexit Algorithmi ..." or "Algorithmi says ...", leading to today's word "algorithm". Syrian license plates provide constant drill on reading the Arabic numerals. A small western equivalent is in the corner. You can try to read the plate at a distance as you approach a parked car, and then check your work when you get close enough to read the western version.